This Valentine DD Duplex Drive is in private ownership but can be seen at many of the military vehicle events during the summer in Britain. It was restored by John and Colin Pearson who purchased it from a farmer who got it from surplus after the war and used it as a bulldozer. It is the only one left in the World. Some of the original DD parts which were removed for bulldozer use were luckily kept by the farmer. The original flotation screen components were either missing or unusable, John used an old tarpaulin and fireman's hose for the inflatable supports, and fabricated the supporting arms to restore the flotation screen. This Valentine DD is a Mk.9 not a Mk.8, only difference is the engine fitted to the tank. The Mk.8 was fitted with an AEC engine and the Mk.9 was installed with a GMC engine: all DD Valentine's were built with the GMC engine. By 1944 the British Valentine tank was out classed by German tank advances and not fit to be in action. 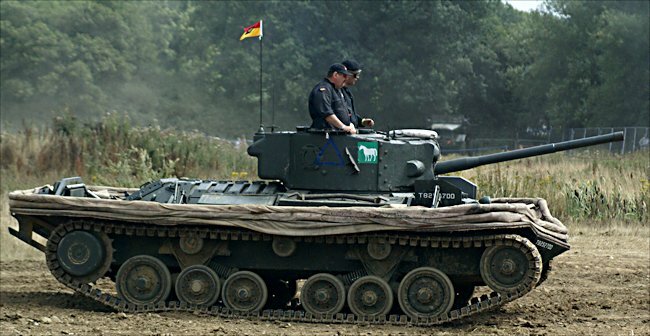 It was used in tank crew training roles as well as a test bed for some of Churchill’s "funnies". Lessons had been learnt after the disastrous raid on Dieppe where the Churchill Mark I tanks could not even get off the beach. All sorts strange engineering marvels were devised to overcome different technical combat problems, like how to breach sea defence walls, clear minefields and destroy bunkers. The Valentine was used to see if a tank could be launched off shore from a landing craft. It would have to swim ashore to give tank support to the attacking infantry during the first wave of the landings on Normandy beaches in the first moments of D-Day. Their main job was to engage and neutralise German beach machine gun pillboxes. Reconnaissance had shown that the German Atlantic wall defences had large anti-shipping metallic spikes with mines on the top to stop bigger tank landing craft actually getting on the beach. The smaller troop carrying craft could get through with care. The DD tanks wore canvas flotation collars raised on steal arms and were equipped with rear mounted propellers powered in the water by the tanks engine. The tank commander needed a periscope to see over the floating screen. It was found that the big danger point was when the valentine DD tank entered the water down the landing craft ramp. There was a real problem of water coming over the top of the screen and swamping the tank. If the tank did launch successfully there was still a danger of the tank drowning if the sea was too rough and waves came over the top. 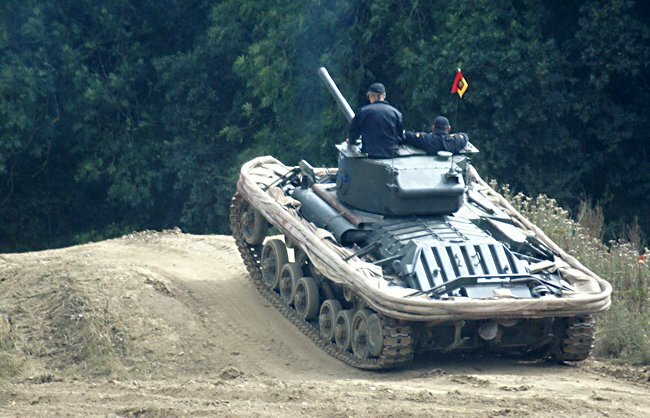 The Royal Navy assisted with part of the tank DD crews training. A Chief Petty Officer who was teaching the tankers underwater escape drills commented "Rather you than me mate". Lieutenant Stuart Hills of the Nottinghamshire Sherwood Rangers Yeomanry expressed quite succinctly what most crews felt, "Being a bloody sailor in a bloody tank was taking patriotism too far". On 4th April 1944 six tanks of the 4/7 RDG "drowned" with the loss of six men in a very heavy swell off Poole. Because the very existence of DD tanks had to be kept very secret the tanks squadron commander could only write to one of the men’s widows in the vaguest of terms. He said that her husband had died bravely at dawn. He promised to write again in more detail when he could. Unfortunately he was killed in action in the first few days of the Normandy campaign. His widow did not discover what really happened to her husband for nearly fifty years. She had concluded that he had been "shot at dawn". She had felt too ashamed to make further enquiries or to claim a widows pension. The DD conversions were added to the new M4 Sherman tanks. Lance Corporal Patrick Hennessey recalls waiting in his DD M4 tank for the off order. His squadron were going to be part of the attack on Sword Beach. The condition of the sea was not ideal. It was choppy as there had been a storm the day before which had delayed the attack by 24hrs. "I then heard the order over the ship’s tannoy, ‘Down door number 1’. We knew that was our cue. On 07.30 hours on 6th June 1944 we trundled off the ramp and nosed into the choppy grey, threatening waves. The shore line was a long 5,000 yards away. " 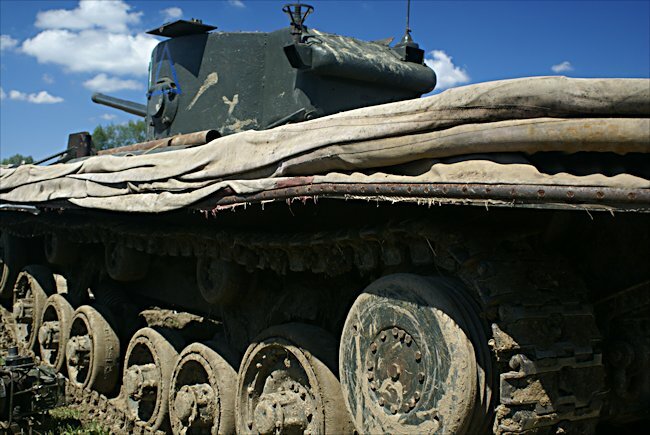 "All the crew sat on the deck of the tank except the driver. We were several feet below the surface of the sea and we expected at any moment for a big wave to come over the top and flood us. The driver was nervously intent on keeping the engine running. If it stopped that was it. We would be finished. The co-driver energetically operated the bilge pump to eject the water that did lap over the top of the curtain. To our right we saw Captain Noel Denny’s tank wallow into the water. The landing craft, pushed on by the swell moved forward involuntary and forced it under the water. Only one of the crew survived." B and C companies of the American 741st independent tank battalion had launched thirty two DD Sherman tanks fifty minutes earlier off Omaha beach 5-6km from land. The sea was rougher than they had encountered in training. Captain James Thornton, the B company commander said of his experience, "I saw the tank behind mine immediately swamp and sink as did the fourth to launch. After only few yards struts snapped under the pressure from the sea, canvas tore and water flooded the engine compartment. My tank went down nut all my crew managed to get out safely." Within three minutes of launching into that rough sea twenty seven out of the thirty two American DD Sherman tanks had sunk. Only two tanks managed to swim to the beach. Three remained on the landing craft due to damage caused during a collision when they tried to exit the craft. Only a few of the 135 DD tank crews struggling in the water were picked up. Most could not swim to the shore. It was too far away and they drowned. It was a disaster. Back in the sea just off Sword Beach in his floating British DD Sherman tank, Lance Corporal Patrick Hennessey recollects, "We were being buffeted about unmercifully, plunging into the troughs of waves and somehow wallowing up again at the crests. The wind was behind us which helped. As we struggled to keep on course the shore line became more distinct. Before long we could see the line of houses which were our targets. It took more than an hour of hard work before we walloped on to the beach. It was a miracle that most of us made it to dry land. We got the curtains down and into the tank sharpish. Within a minute we had fired our first shot in anger. A puff of smoke and brick dust denoted the strike on the first fortified house. We remained at the water’s edge while the beach, which had been practically deserted when we arrived, was beginning to fill up fast. Infantry were wading ashore all around." The Germans were totally amazed to see tanks swimming ashore under their own power. One driver recalled, "I still remember very vividly some of the German machine gunners standing up in their posts looking at us with their mouths wide open." At the end of the first day the British and Canadians had driven six miles inland at the cost of 3.500 British and 1,000 Canadian casualties. The Americans who only used a few DD tanks and no other armoured support "funnies" suffered 6,600 casualties and penetrated only two to three miles. Where can I find other preserved British Valentine Tanks?